Prognostic factors are divided into two clinical and biological groups. Clinical factors are obtained using blood tests and radiological and microscopic evaluation of biopsies. Tumor grading is one of these important factors. Several grading systems have been introduced for prostate cancer. One of these methods, which is very acceptable, is Gleason's grading. This method is based on the patterns of tumor cell differentiation. Range of grading is from one to five. Total Gleason's grading (score) is obtained by sum of total grades of primary and secondary patterns together. Therefore, Gleason's grading will vary from 2 to 10. Gleason's grade is 2-4 in well-differentiated tumors, 5-7 in moderately differentiated tumors, and 8-10 in poorly differentiated tumors. Regarding Gleason's grading, probability of patients' mortality is determined. Biological factors are other categories of prognostic factors. Among these P53, P27, and Ki-67 can be noted. In some studies, the incidence of P53 has been associated with higher grades of tumors and worse prognosis of the diseases. Although another study showed different results, nuclear staining for P53 was positive at least in the aggregates of tumoral cells. Ki-67 is a type of cellular protein that is found during duplication. In fact, Ki-67 is one of the cell cycle regulator proteins. Ki-67 index was higher in carcinoma than hyperplasia and higher in metastatic than nonmetastatic cases. 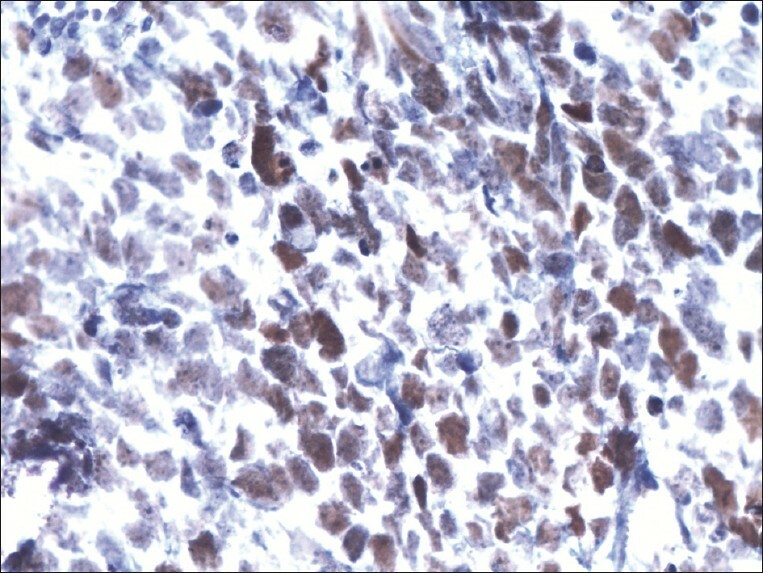 Additionally, Ki-67 index is determined by immunohistochemical (IHC) techniques and an increased Ki-67 index may indicate a poor prognosis of disease. ,,, Considering the proven correlation between Gleason;s grading and prognosis of prostate cancer, along with proposing of P53 (a tumor suppressor protein) and Ki-67 (MIB-1) as prognostic factors; this study was performed to investigate the freguency of these markers expressions in prostate cancer and their probable relation with Gleason's grading. In this cross-sectional study, paraffin blocks of prostate cancer biopsies of 49 patients diagnosed between 2005 and 2007 were used. Recuts were prepared and were stained by hematoxylin-eosin method. The slides were examined and the tumor's grade was determined by using Gleason's grading system. 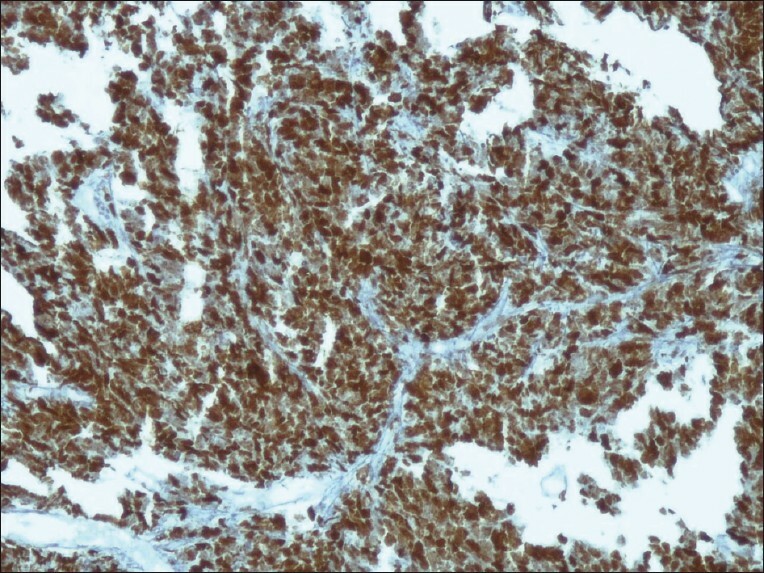 Thereafter, appropriate sections were prepared for IHC staining and slides were stained forP53 and Ki-67 markers. The results were evaluated blindly by another pathologist. Each slide was evaluated at ×40 magnification in order to find areas with maximum positive cells. Then these areas were examined at ×400 magnification and the percentage of positive cells to total cells was calculated. In this study, at least 500 cells were counted and only the cells that were definitely positive for the desired marker were considered. P53 was reported as positive or negative, whereas in case of Ki-67 the tumors were divided into five groups regarding the percentage of positive cells. 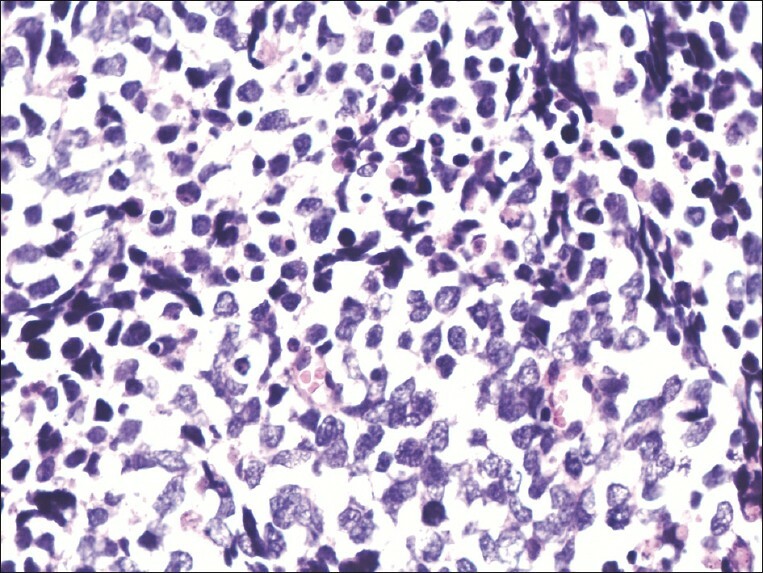 Cases in which the percentage of stained cells was less than or equal to 2% were considered negative. Cases with Ki-67 index of less than or equal to25% were considered 1+, 26-50% as 2+, 51-75% as 3+ and 76-100% as 4+. The results were analyzed and evaluated with SPSS software version 15. For statistical analysis of Gleason's grading Spearman's statistical test was used. Forty-nine cases in total were investigated. The mean age of patients was about 74.5 ± 8.3 years, with a range of 48 to 94 years. Categorizing patients according to combined Gleason's grading, three patients (6.1%) were graded 4, three others (6.1%) were graded 5, eight(16.3%) were graded 6,ten (20.4%) were graded 7, eleven (22.4%) were graded 8, seven (14.3%) were graded 9 and seven (14.3%) were graded 10. Based on tumor differentiation, three (6.1%) cases were reported as well-differentiated, 21 (42.9%) as moderately differentiated and 25 (51%) as poorly differentiated [Figure 1]. In IHC staining for P53, 28 cases (57.1%) were reported as negative and 21(42.9%) cases as positive. Nine cases (42.8%) of moderately differentiated tumors and 12 cases (48%) of poorly differentiated tumors were positive for P53. On the other hand 12 cases with moderate differentiation (57.1%), 13 cases with poor differentiation (52%) and 3 cases with well differentiation (100%) were negative for P53 [Table 1]. As a result, no significant correlation was found between positive cases of P53 and increased Gleason's grading in the present study [Figure 2]. In Ki-67 stained samples, 14 cases (28.6%) were negative (index <2%), of which three, eight, and three case were poorly, moderately, and well differentiated, respectively. Twenty-four cases (49%) were reported as 1+ with equal frequency in both poorly and moderately-differentiated tumors. Six cases (12.2%) as 2+, of which five and one were poorly and moderately- differentiated, respectively. Two cases (4.1%) were 3+ belonging to poorly differentiated group and three cases (6.1%) were 4+ also three belonging to a poorly differentiated group. In cases of well-differentiated tumors, all were negative for Ki-67. Of 21 cases of moderately differentiated tumors, eight cases (38%) were negative, while 12 cases (58%) were indexed as 1+ and one case (5%) as 2+ [Figure 3]. Concerning Ki-67 index in poorly differentiated tumors, three cases (12%) were negative, whereas 12 cases (48%) were 1+, five cases (20%) 2+, two cases (8%) 3+, and three cases (12%) 4+ [Table 2]. Consequently, a statistically significant correlation was observed between Ki-67 positivity and increased Gleason's grade (Spearman correlation test) (P=0.001). Ki-67 marker was positive in 35 out of 49 tumors in current study (71.4%). Theodoropoulos  showed a significant relationship between Ki-67 index and Gleason's grading of tumors with low- to high-grade differentiation. Nilson et al. showed a significant correlation between positive cases of Ki-67 and also tumoral cell differentiation. All poorly differentiated tumors, fewer than half of the moderately differentiated tumors and only one of well-differentiated tumors were positive for Ki-67 in this study. In addition, all cases of hyperplasia (BPH) were negative for Ki-67. The results of our study are consistent with the above-mentioned studies. This study also showed that the incidence of Ki-67 expression might strongly indicate prostate cancer. Ki-67 was not confined to the basal-cell layer in all positive studied cases. Luminal cells (channel) were also positive in some cases. However, in cases of benign hyperplasia less than 2% of cells were shown to be positive for Ki-67 marker. The present study also showed a statistically significant correlation between the Ki-67 marker and increased Gleason's grading with increased number of stained cells (P=0.001). Considering that most cases of prostate cancer are diagnosed microscopically before metastatic spread and among these, few cases have rapid and life-threatening outcome. Therefore, if these groups can be differentiated from each other we can help patients remarkably. In the current study, Ki-67 marker was shown to have a strong relationship with Gleason's grading, which has an important relationship with the prognosis of prostate cancer. Therefore, we propose that this marker can be applied along with other prostate cancer prognostic factors. Besides, P53 marker can be used in the diagnosis of malignant neoplastic proliferation. The authors of this paper would like to thank all members of the Molecular Pathology Research Center. This paper obtained from the research project No. 87043 KUMS. 1. Epstein JI. The lower urinary tract and male genital system. In: Kumar V, Abbas AK, Fausto N, Aster JC, editors. Pathologic basis of disease. 8 th ed. Amsterdam: Elsevier; 2010. p. 993-1002. 2. Epstein JI, Amin M, Boccon-Gibod L, Egevad L, Humphrey PA, Mikuz G, et al. Prognostic factors and reporting of prostate carcinoma in radical prostatectomy and pelvic lymphadenectomy specimens. Scand J Nephrol 2005;216:34-63. 3. Epstein JI, Steinberg GD. The significance of low-gradeprostate cancer on needle biopsy. A radical prostatectomy study of tumor grade, volume and stage of the biopsied and multifocal tumor. Cancer 1990;66:1927-32. 4. Aprikian AG, Cordon-Cardo C, Fair WR, Zhang ZF, Bazinet M, Hamdy SM, et al. Neuroendocrine differentiation in metastatic prostatic adenocarcinoma. J Urol 1994;151:914-9. 5. Borre M, Stausbot-Gron B, Overgaard J. P 53 accumulation associated with bcl-2, the proliferation marker MIB-1 and survival in patients with prostate cancer subjected to watchful waiting. J Urol 2000;164:716-21. 6. Laitinen S, Martikainen PM, Tammela TL, Visakorpi T. Cellular changes in prostate cancer cells induced by intermittent androgen suppression. Eur Urol 2007;52:725-32. 7. Theodoropoulos VE, Tsigka A, Mihalopoulou A,Tsoukala V, Lazaris AC, Patsouris E. Evaluation of neuroendocrine staining and androgen receptor expression in incidental prostatic adenocarcinoma: Prognostic implications. Urology 2005;66:897-902. 8. Aaltomaa S, Lipponen P, Vasalainen S, Ala-Opas M, Eskelinen M, Syrjanen K. Value of Ki-67 immuno labellingas aprognostic factor in prostate cancer. Eur Urol 1997;32:410-5. 9. Minner S, Wittmer C, Graefen M, Salomon G, Steuber T, Haese A, et al. High level PSMA expression is associated with early PSA recurrence in surgically treated prostate cancer. Prostate 2011;71:281-8. 10. Chi SG, Dever White RW, Meyers FJ, Siders DB, Lee F, Gumerlock PH. P53 in prostate cancer: Frequent expressed transition mutation. J Natl Cancer Inst 1994;86:926-33. 11. Sasor A, Wagrowska-Danilewicz M, Danilewicz M. Ki-67Antigenand P 53 protein expression in benignand malignant prostatic Lesions. Pol J Pathol 2000;51:31-6. 12. Haussler O, Epstein JI, Amin MB, Heitz PU, Hailemariam S. Cell proliferation, apoptosis, oncogene, and tumor suppressor gene status in adenosis with comparision to benign prostatic hyperplasia, prostatic intraepithelial neoplasia, and cancer. Hum Pathol 1999;30:1077-86. 13. Nilsson S, Nordgren H, Karlberg L, Harvig B, Busch C, Hall T, et al. Expression of estramustine-binding protein (EMBP) and the proliferation-associated antigen Ki-67 in prostatic carcinomas. Scand J Urol Nephrol 1988;110:31-7. 14. Bankhoff H, Stein U, Remberger K. Multi-directional differentiation in the normal, hyperplastic and neoplastic human prostate: Simultaneous demonstration of cell-specific epithelial markers. Hum Pathol 1994;25:42-6. 15. Mikuz G. Pathology of prostate cancer. Old problems and new facts. Adv Clin Path 1997;1:21-34.